For me, one of the easiest and most comforting desserts is a fruit crisp. With a few strokes of the knife and a quick mixture of flour, sugar and butter you have a wonderful reason to eat all your dinner. Your kitchen will smell divine too. I like my crisps to have a lot of topping. I want to hear the crunch when I bite into all that buttery goodness. I am reminded of Julia Child’s quote, “With enough butter anything is good.” Tomorrow I’ll work out a little longer on the elliptical machine at the gym. If you have ever wondered what the difference between a crisp, a crumble or a cobbler is, below is a brief description. 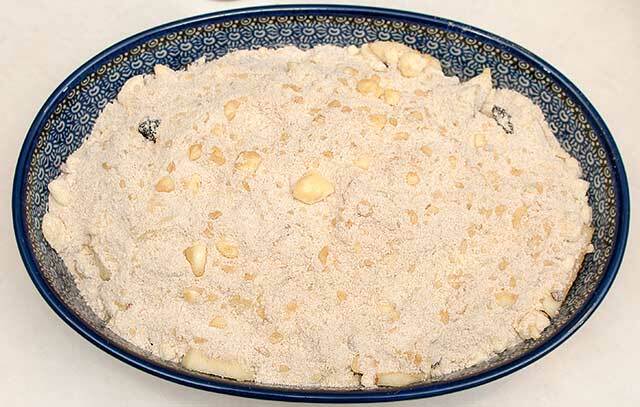 A crisp – consists of fresh fruit topped with a flour, butter and sugar mixture that is baked in the oven. Often other additions are nuts and other dried fruit. 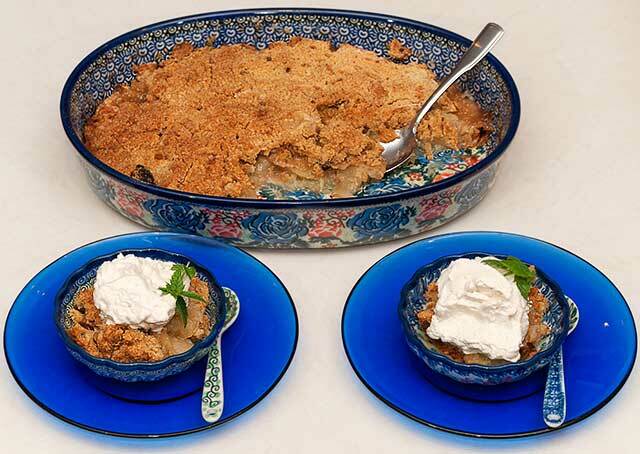 A crumble – consists of everything in a crisp but you add oats to topping. A cobbler – consists of fresh fruit that has biscuit dough dropped on top of the fruit. When the biscuits bake and spread together they resemble cobblestones, hence the name cobbler. A buckle – consists of a cake-like batter topped with fruit. As the cake bakes, the fruit sinks into the batter, hence the name buckle. A grunt or slump –this is the same thing as a buckle; but you cook the dish on top of the stove rather than baking it in the oven. For the apple crisp, slice 6 cups of apples into a medium size baking dish. 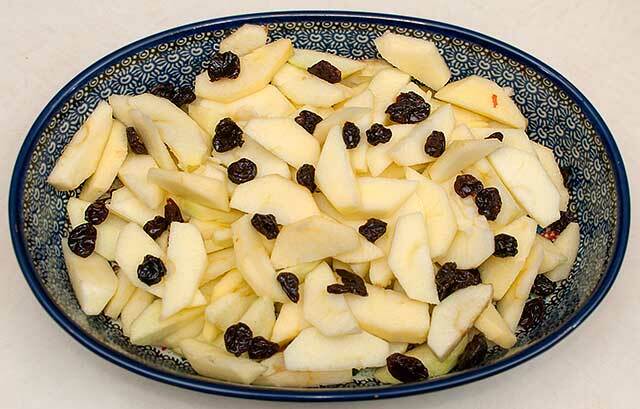 Sprinkle the dried cherries on top of the apples. 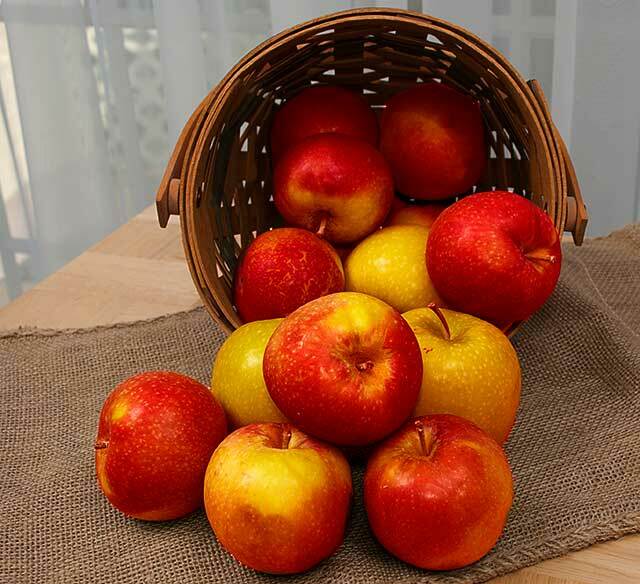 I like to use Granny Smith apples mixed with Macintosh or Honey Crisp. The granny smith apples stay firm while the other apples get a bit softer. The consistency of the baked fruit is less mushy. In a medium size bowl, mix together the flour, butter, brown sugar and cinnamon. Cut the cold butter into the flour using a pastry blender or a fork. Sprinkle the topping over the apples. 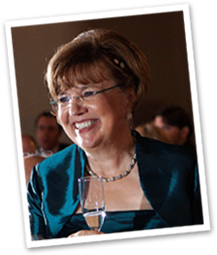 Bake in a preheated 350 degree oven for 50-60 minutes until the apples are bubbling. Top with the Honey Cinnamon Whipped Cream. 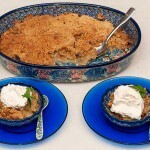 An apple crisp with extra thick topping. In a medium size bowl, mix together the flour, butter, brown sugar and cinnamon. Cut the cold butter into the flour using a pastry blender or a fork. Sprinkle the topping over the apples. Top with the Honey Cinnamon Whipped Cream. Enjoy!! The dish on the right – with the extra whipped cream – is the one I ate. Delicious.